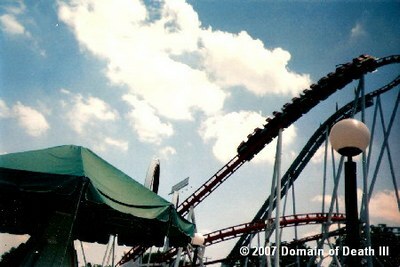 Laser was a rollercoaster that once resided at Dorney Park & Wildwater Kingdom in Allentown, PA. 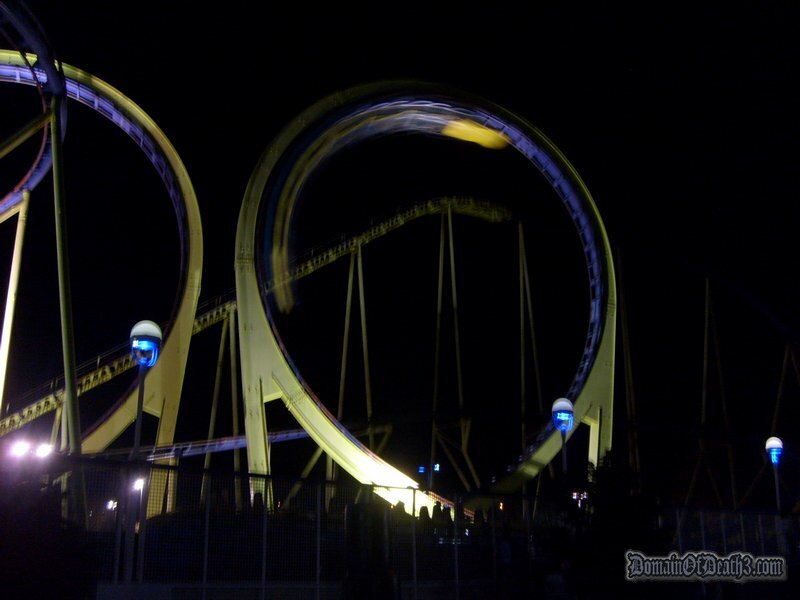 It was designed by Anton Schwarzkopf, the man who has made countless coasters and flatrides and who designed the first modern coaster to execute a vertical loop, Revolution at Six Flags Magic Mountain in California. As of 2008 the Laser closed at Dorney Park and has supposedly been sold to the German fair circuit. Laser is basically a production line Schwarzkopf model with the trade name “Doppel Looping,” which translates to “Double Looping.” Before it was ‘Laser’ it resided at Playcenter São Paulo and was named Colossus. Laser, like many Schwarzkopf models, is actually a portable rollercoaster; the supports on Laser aren’t attatched to the ground, but instead are all attached to large water filled bases which sit on wooden blocks. The coaster can use two trains but normally uses one. The trains contain seven cars of four seats per car. Riders are secured with simple individual ratcheting lapbars. The Laser is a very short ride, probably only 50 seconds from the first drop to the brakes; but in those 50 seconds, riders are completely leveled with G forces and speed. First off, riders go to designated lines and await the train to arrive back at the station. The trains are the classic streamlined Schwarzkopf trains with high seat backs and. asnoted before, simpleratcheting lapbars tokeep riders secure. Once everyone is secured, the train lurches forward and embarks on a long trip up the lift hill. This has got to be one of the slowest lifts ever; Laser uses a different chain lift system than other coasters and the design itself simply runs slower than other lifts. In a Laser review over at Theme Park Critic , one user claimed that the lift was actually an ” intentionally-disarming psychological ploy.” Once at the top, the train hangs over the steep curving drop for a couple of seconds before gravity takes over and sends the train rocketing down the hill. The Laser in 1993. You can just bairly make out its old red and white paintjob. Immediately after the drop the train ploughs into two Schwarzkopf style loops. 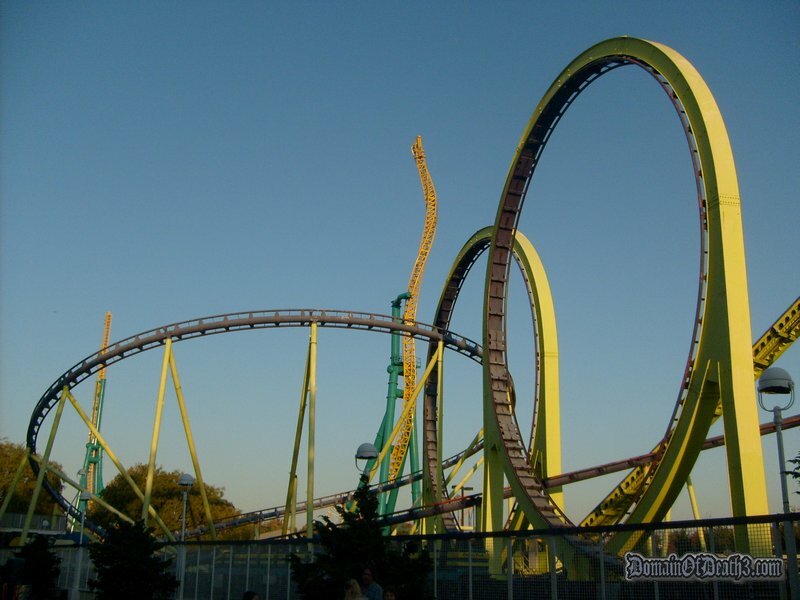 Schwarzkopf made loops more circular than today’s variations which are more teardrop shaped, in effect the loops on Schwarzkopf coasters are much more G-force heavy. I think the loops officially pull just over 5 Gs. All I know is that I always start to see spots and sparkles as I go through the second loop; the classic sign of being close to blacking out. Just after the second loop the train slams into turn that looks near impossible to navigate. The turn comes within inches of the station and bends upward into an inclined helix (spiral) turn. The track turns through the center of the second loop, then pitches downward to complete the turn. Next the train shoots up a straight incline through the space in between the two loops and enters a second helix, only in the opposite direction. This second helix starts high and swoops down immediately; the rest of the turn is made parallel to the ground. This helix has an incredible amount of G forces since the final flat part is taken at full speed. After exiting the second helix, the train cruises into the brakes, still traveling very fast. The brakes on Laser are different than most coasters in that they are located on the sides rather underneath the train; the trains are equipped with brake fins on each side of the train. These brakes were replaced in 2006 with magnetic brakes. After the train travels through the brake run, which spans the entire length of the coaster, the track turns to the right and enters a second brake section, turns right again, and enters the station. The Laser certainly doesn’t look like much of a ride, but in reality it’s probably one of the most intense coasters a lot of people will ever go on in the area. The layout provides no breathing room at all; it’s just high speed element after high speed element. Laser (or Double Loop) is actually one of the four models that Schwarzkopf made which resemble each other only with a different number of loops and a slightly different layout. The first model was the “Looping Star” which had one loop (found at many European traveling carnivals and Strates Shows in the US.) Next was the SilverArrow model which featured one loop but a different layout. The Scorpion at Busch Gardens Africa (in Tampa, FL) is a SilverArrow model. Following that was the “Doppel Looping” with the two loops. Finally there was “Drier Looping” which features three loops and a much more intense ride. A notable Drier Looping is the Mindbender in the West Edmonton Mall in Edmonton, Alberta, Canada. More about Anton Schwarzkopf coasters and rides can be found at Schwarzkopf.coaster.net . There is an identical coaster to Laser at Lagoon amusement park in Utah. It is called Firedragon. It was installed in 1983 after a tour through Europe’s traveling carnival circuit. It is still in operation. Great ride for such a small footprint. At the end, when you hit the brakes after that last ground level helix, I always almost black out. Can’t do this ride twice in a row because of that! What a head rush! Great site, by the way! I enjoy your thoughts and opinions, esp. the WTCR, which are some of my favorite classic rides! I love some of the descriptions you have for them!